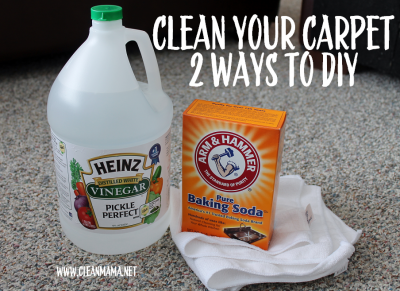 Try this easy DIY Carpet Cleaner in your home in Birmingham AL. Getting spots and stains out of your carpet can be done with these two ingredients you probably already have in your cupboards; baking soda and white vinegar. Cleaning up all those random spills and drips left on your carpets by children, pets and others does not have to be difficult. Try this easy solution you can make yourself. To mix your own carpet spot cleaner, all you need is baking soda and white vinegar. Really, that’s all you need! The key is to apply the two ingredients in the correct order: white vinegar followed by baking soda. Pour a small amount of vinegar on the stain, followed by a sprinkle of baking soda. The vinegar works to saturate and soften up the dirt and grime, while the baking soda does the lifting and deodorizing. If you see the mixture bubbling up, you will know it is working. Together, the two ingredients work as a team to lift the stain to the surface. If you have a minor stain you can leave the mixture on the spot until it dries up. Then, you just vacuum it up. If you have tougher stains, just let the mixture sit for 30 minutes or so and then rub or blot up the stain with a damp cloth. If you have a really stubborn stain, let it dry thoroughly and then vacuum. That’s it! This simple concoction can work wonders on almost any stains, from pet stains, to food stains, to just plain old black dirt and grime. If this DIY Carpet Cleaner in Birmingham AL does not work for you, or you don’t have time, you can always call the professionals at Heaven’s Best Carpet Cleaning to save the day! Heaven’s Best has strong professional strength spot removers for almost any stain. 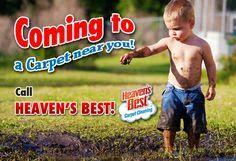 Call Heaven’s Best at (205) 618-9150 and let us clean up all your carpet stains.